Presenting the action plan of the Cabinet of Ministers of Ukraine for 2016, Prime Minister Arseniy Yatsenyuk noted the need for further land reform and sale of one million hectares of state-owned land at the auction. He said this in the Ten Minutes with Prime Minister of Ukraine TV programme on Sunday evening. 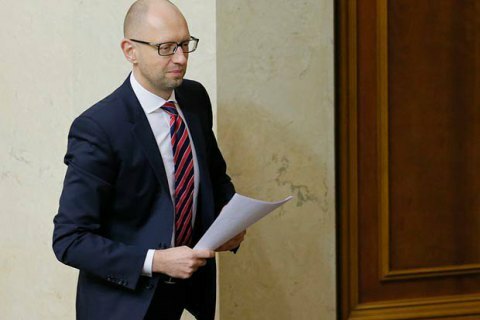 "I think we need to sell one million hectares of state-owned land, which is in shadow and corrupt turnover now, at the open transparent auction," Yatsenyuk said. Speaking about the health care reform, the Prime Minister said it was necessary to introduce the minimum level of free medical services, guaranteed by the state, this year. "The rest should be financed at the expense of the state medical benefits fund, where every citizen of the country should get insurance at," Yatsenyuk noted. In addition, according to him, the Government also suggests maximizing the efficiency of capital investment in 2016. "70% will be allocated for reconstruction of the roads, 30% will be spent on completion of the facilities which are in the final stage of construction," the Head of Government said.